Windows Timeline is a feature that was added to the Windows 10 operating system in April 2018. This feature displays app and web browsing activity from all devices using the same Microsoft account in a chronological timeline. Websites and apps can be opened directly from this list. What Does Windows Timeline Do? The Windows 10 Timeline feature records a history of app usage and web browsing locally on a Windows 10 device and allows for a user to view it all and pick up from where they left off. For example, instead of trying to remember what the address of the website you visited two days ago was, you can now simply open Windows Timeline, scroll down the list to what you were doing two days ago, and click on the image thumbnail of the website to open it in the Microsoft Edge web browser. Windows Timeline data can also be synced to the cloud to be accessed on other Windows 10 devices with the same Microsoft account. A variety of smartphone apps on iPhone and Android also support Windows Timeline syncing. If using the same Microsoft account on an iPhone for example, an Excel document opened on it will show up in your Timeline on your Windows 10 PC. Clicking on it in your Timeline will open it on your PC allowing you to pick up where you left off. How Do I View Timeline on a Windows 10 PC? There are two ways to view your Windows Timeline when using a Windows 10 PC or tablet. Both methods work when either on the desktop or in an open app. 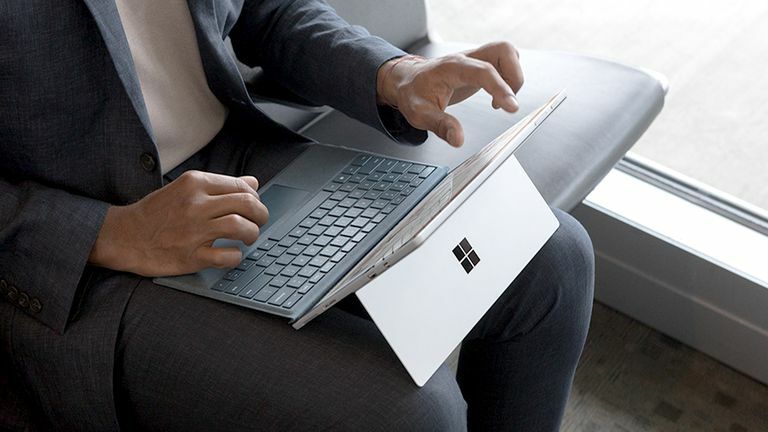 If your Windows 10 device has a touchpad or mousepad attached either directly or via Bluetooth, simply swipe up on it with four fingers to bring up your Windows Timeline. If you have a keyboard attached, you can view the Windows Timeline by pressing the Windows key and the Tab key simultaneously. How Do I Enable Windows Timeline Syncing? iPhone and Android smartphone apps that support Windows Timeline already sync data to the cloud by default as long as you're logged into them with the same Microsoft account. Your base Windows 10 PC or tablet also displays its app history and those of connected smartphone apps in Windows Timeline by default. This basic Timeline functionality does not need to be turned on. If you want your Windows 10 device to sync to the cloud though so that you can view its activity on another Windows 10 computer or tablet, this does need to be manually activated. There are two ways to do this. Open your Windows Timeline by pressing the Windows and Tab buttons on your keyboard or by swiping up on the touchpad with four fingers. Scroll down to the bottom of Windows Timeline list. You should see a text message saying See more days in Timeline and a button that reads Turn on. Pressing this button will sync this Windows 10 device's app usage to the cloud so it can sync to another Windows 10 device that uses the same account. Press the Turn on button. Open Windows 10's Action Center by swiping a finger in from the right side of the screen (on a touchscreen device) or by clicking the small box icon in the lower-right corner. On the left menu, click on Activity history. Click the check box next to Let Windows synchronise my activities from this PC to the cloud. This box should be checked if you want this option enabled. How Can I Disable Windows Timeline Syncing? If you don't want your Windows 10 device to keep a history of all of your app usage, you can disable Windows Timeline completely. Here's how. Open Action Center on your Windows 10 computer or tablet either by swiping in from the right side of the touchscreen or by pressing the Activity Center icon in the bottom-right corner of the screen that looks like a box. From the main menu on the left side of the screen, tap on Activity history. Uncheck the box next to Let Windows collect my activities from this PC. If this box is already unchecked, then you don't need to do anything. If the box next to the second option, Let Windows synchronise my activities from this PC to the cloud, is checked, you should uncheck it as well to prevent your app usage data being sent to Microsoft's servers. Why Should I Use Windows Timeline? Windows Timeline is very useful for those that use multiple devices as it allows you to view some of your app history all in one place and pick up where you left off. It's particularly useful when wanting to open a webpage on your Windows 10 computer that you were reading earlier on your iPhone or Android smartphone. If you were using the Microsoft Edge browser on your phone, all you need to do is open Windows Timeline on your PC and select it from your activity history to open it immediately in Edge. It's much faster than emailing yourself a web link. The same works for opening Microsoft Office files as well.